Introducing one of Birra del Borgo's most bizarre and original creations: a taste of Autumn, created with a very special procedure. Chestnuts are dried for several days and then blended with the barley malt during the brewing process. The opened bottle releases notes of chestnut honey and smoked wood, and offers an inebriating taste experience. 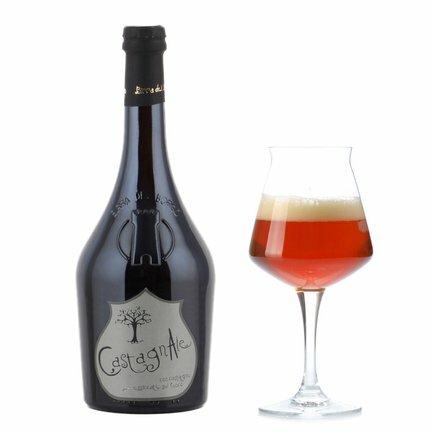 CastagnAle is also an amber ale that goes splendidly with cured meats, including smoked meats, and robust soups. Ingredients Water, malted barley, chestnuts, hops, spices, yeast, sugar. Contains gluten. For more information on product labels, please contact our Customer Service department. The information on the labels of the products may vary for reasons beyond our control, therefore, there may be discrepancies between the information on the site and that on the products delivered. Please always check the information on the product before consumption or use.